At San Juan, we meet with the people of La Voz [La Voz Que Clama en el Desierto], a Fair Trade cooperative. Green Mountain and Heifer International have been working together with La Voz on a number of projects. 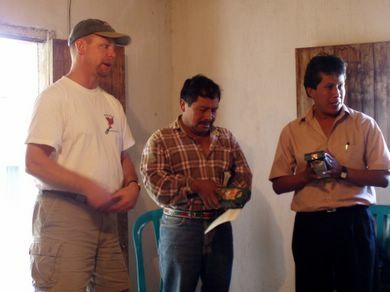 GMCR’s Steve Sabol presents the people of La Voz with our Heifer Hope Blend. For all the years these good people have been growing coffee, they’ve never before seen the end result.